Your shoppers can use myAccount to track the evolution of orders from the moment they were placed to delivery/fulfillment. After logging in to myAccount, customers need to click the Order Lookup tab. Provided that they have a valid purchase reference and the email address used when placing the order, they can leverage Order Lookup to track order status in real time. In addition to getting status information, Order Lookup can also be used to search for transaction details. This feature enables your shoppers to monitor the payments made through the Avangate system and receive all their details. They first have to provide the first and last four digits from the card used in the transaction, the total amount paid and the currency. If the information supplied matches payment data in the Avangate system, the system offers additional transaction details via email. Both examples of functionality described above are available regardless of whether your shoppers logged into their myAccount or not. However, it's recommended that they create a myAccount and log in to access complete order and product/service data. Avangate myAccount features a set of subscription management capabilities, enabling shoppers to easily deal with the renewal process of existing subscriptions. Clicking Renew now redirects users to a shopping cart that is pre-filled with the data stored in Avangate (also available in their myAccount), where they can proceed to prolonging the subscription/buying a subscription renewal. The purchase process involves reviewing the existing details and making sure they're correct, entering financial information for the transaction and placing the order. When purchasing subscriptions, shoppers can choose to enable auto-renewals/recurring billing. If enabled, the feature automatically renews subscriptions before they expire, avoiding any usage interruption. This service is provided through highly secure protocols in compliance with PCI-DSS standards. Shoppers can cancel auto-renewals any time by logging in to Avangate myAccount and clicking the Stop automatic subscription renewal link or by following the instructions in the subscription expiration notification email. Shoppers can also use myAccount to configure the setting of automatic email subscription expiration notifications. Customers can manually order upgrades, when they're available, from their myAccount. Avangate redirects shoppers to a checkout interface where they can configure the upgrade details in accordance to their preferences. Product history becomes available as soon as the first change in the licensing of a product/service is performed, whether it's an action executed by the customer or an automated task, such as auto-renewal. Once it's available, shoppers need to log into their myAccount and access to product history will be available by clicking on the product name or on the Product history link. At the bottom of the page, the Avangate system will list all licensing changes track, enabling customers to easily get even more information, such as the order details for a renewal, for example. Unlike product history, purchase details are available for orders successfully placed, even if not finalized/delivered. Clicking on the order reference number for each purchase provides access to a complete set of details including status, reference number and evolution, costs, invoice (complete with print and download options), delivery and billing information, download links, registration info, product history, subscription reference and expiration date. Shoppers can find product file download links and keys/codes in the My Products page. Activation keys / codes are listed under Registration info, along with additional delivery information. Customers need to click Download product to access the product file associated with the offering. When the DIS (Download insurance service) is enabled, your shoppers will enjoy an extended life span of the download link for a total of two (2) years. DIS also allows them to download the item an unlimited number of times. Both keys and download links are also available when clicking the order reference number to access the complete details for a purchase. Your shoppers can keep their subscription alive by making sure that their billing information is always up to date. At the same time, they can choose to replace the credit card used to charge renewal orders (manual or automatic) with another one. Furthermore, the initial payment method (which has to support recurring billing) used to acquire a subscription can be replaced with a credit card owned by the shopper. myAccount is designed to support the process of updating credit card information for each standalone subscription purchased. Avangate myAccount offers your shoppers the possibility of adding multiple credit cards to your account. 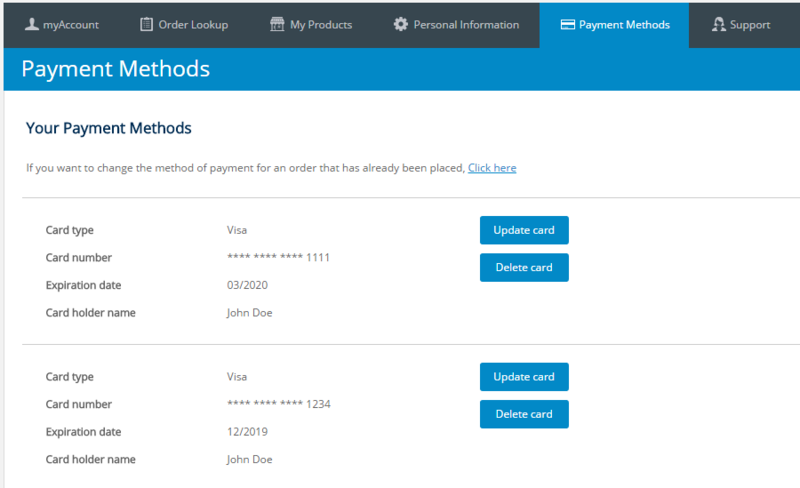 They can add, update and remove credit cards whenever they need from the Payment Methods page. 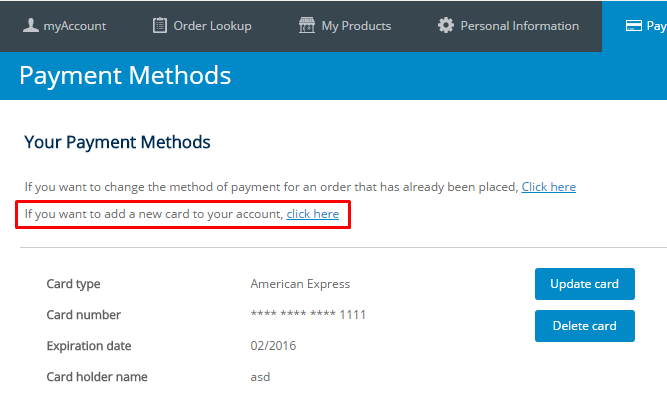 To add a new credit card, click the corresponding link just above the card list, or click the Add card button at the bottom of the page. Next, enter the new credit card information and click Add credit card info. They should now see the new card in the payment method list. Shoppers who need to remove credit cards from myAccount can click Delete card. If they have auto-renewing subscriptions associated with that card, Avangate myAccount notifies them about this and they need to unlink the subscriptions. To do this, they first need to click View subscription for each linked subscription. Once your shoppers have unlinked their auto-renewing subscriptions, they can delete the credit card by clicking Confirm removal. Avangate myAccount displays a confirmation message informing your shoppers about the successful removal of their payment method. 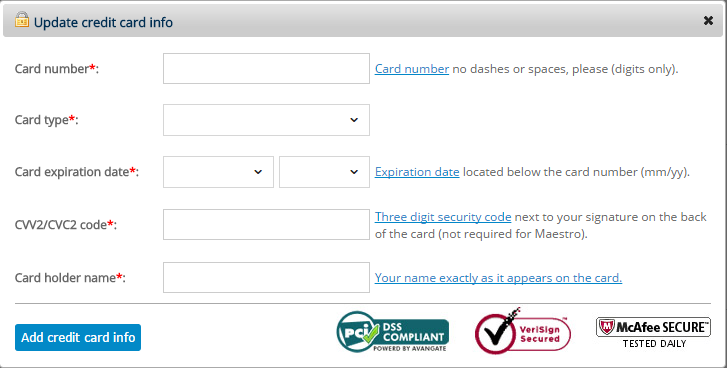 If your shoppers' cards expire soon, they can update the expiration date by clicking Update card. After your shoppers enter the new expiration date, they need to click Save and Avangate updates the information.